This summer, students took part in a long tradition at the University of Idaho Experimental Forest near Princeton, Idaho. First, they watched as Forest Director Rob Keefe felled a pine tree that was likely grown by former students several decades ago at the university’s nursery. When the tree hit the ground, they went to work, plucking ripened cones from its branches and putting them in burlap bags. 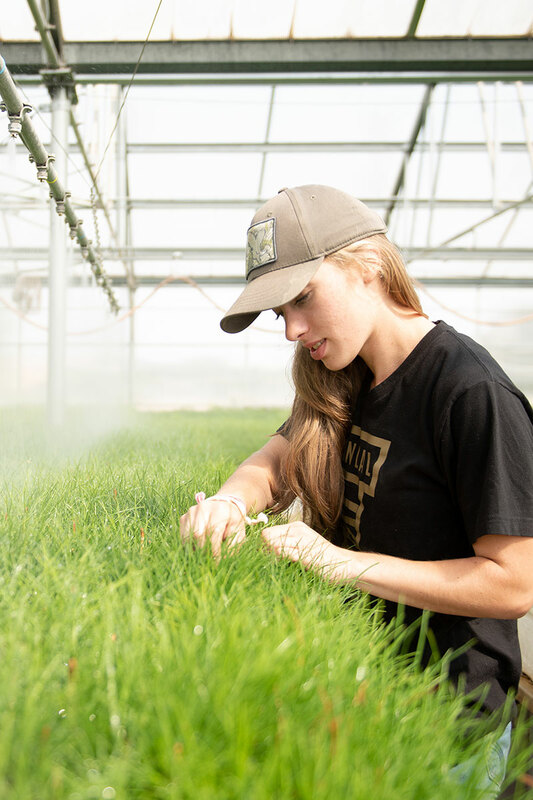 This past year, more than 62,000 seedlings were planted on the Experimental Forest, all of which were grown at the Franklin H. Pitkin Forest Nursery operated by the College of Natural Resources. Some of the seeds collected in summer 2018 will ultimately be part of a future planting. This mutually beneficial relationship is unique, according to Andrew Nelson, assistant professor of silviculture and nursery director. Most other universities that plant trees on their school forests get their seedlings from a federal or private nursery. For many years, the nursery grew trees in open fields, but former nursery director Dave Wenny, Ph.D. ’82, worked with the state legislature in 1984 to build greenhouses at the Parker Farm site off Highway 8 on the eastern edge of Moscow. Today the Pitkin Nursery has seven operational greenhouses and the capacity to grow 500,000 seedlings for research and commercial production. The nursery is not just a business, however. “One of the great things we’ve been able to do is to integrate the nursery with our educational and research programs to fulfill our mission as a land-grant university. That’s why we employ a lot of students here,” Nelson said. Jared Deatherage, a senior in forest resources and fire ecology, found a love of silviculture by working at the nursery and now wants to go into the field. He had high praise for his work experience. After picking cones, the Experimental Forest’s student logging crew bucked the downed trees into logs and decked them for delivery to a local sawmill. Student logging at U of I has been active for over 40 years and in 2018, helped provide wood for the new university president’s residence on the Moscow campus. This year, students will also help supply wood for the new arena.